This page features Ryukyu Islands Tuberculosis Prevention Seals. While these sheets were produced and distributed privately by the Ryukyu Tuberculosis Prevention Association, they are considered by many a collateral collecting interest to the philatelic material of the Ryukyu Islands. They have been catalogued by Mr. Kenkichi Tachikawa in his Handbook of Ryukyu Postage Stamps (1973) and they are extensively discussed and catalogued in From the Dragons Den, the official publication of the Ryukyu Philatelic Specialist Society, LTD. The RPSS catalogue listings are found at Volume 11, Number 4 and Volume 12, Number 1. Ryukyu Island TB Prevention Seals are now (2008 catalogue) listed in the Specialized Catalogue of United States Stamps & Covers and designated WX1-20. All TB seal sheets are Mint, Never Hinged - free of faults - unless noted otherwise in the description. 12½x12 $45.00 US TB seal (candle) overprinted "Ryu Kyu" in block of 9 with printer's mark "E" in center seal. 12½x12 $35.00 US TB seal (candle) overprinted "Ryu Kyu" inscription block of 20. 12½x12 $15.00 US TB seal (candle) overprinted "Ryu Kyu" upper left corner block of 25. 1954 Imperf O/S " " Imperforate, Rare!! 1955 Imperf $55.00 " " Imperforate, Sheet of 20, hinged in margin. Imperforate, inscription block/6. Toning along the bottom margin - not on seals. 1956 Perf (Block/20) $20.00 Upper Right Margin Block of 20 - 4x5 - with Plate Number. 1956 Perf (Block/25) $40.00 Upper Right Margin Block of 25 - 5x5 - with Plate Number, Hinged in Margin. Wrinkling at bottom left. 1957 Perf $40.00 Girl in Everyday Use Kimono - Inscription in position 20. Ten (10) sheets of 20. 1957 Imperf $22.00 " " Imperforate - Inscription in position 20, small pin holes in upper left margin. 1953-1971 Perf Sh/20 $45.00 18 perforate sheets, all the TB seal sheets issued in sheets of 20. 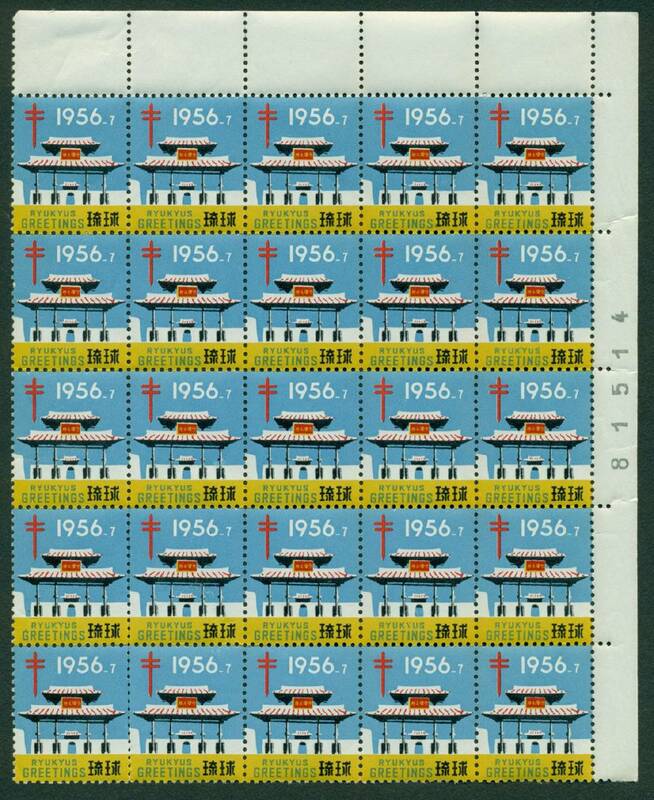 No 1956 sheet. Note that 1952 & 1956 were sheets of 100. 1953 & 5 are Type A, 1954 is Type B. Special Discount. Any order that is filled from this page that exceeds $50.00 will receive a 15% discount. No other discounts will apply to material which receives this more liberal discount and it will not be counted toward the dollar amount specified for other discounts. Just click on box by the item you wish to order and fill out the two information fields below. Place your Preliminary Order for Confirmation. Many of the items are in limited stock and, as with all material, subject to prior sale. I make every effort to keep this page current but there are no guarantees that the material will be in stock. That's why you need to confirm availability.